The scenic view of Blue Hills Beach from Blue Mountain. Blue Mountain as viewed from the Turtle Cove area. 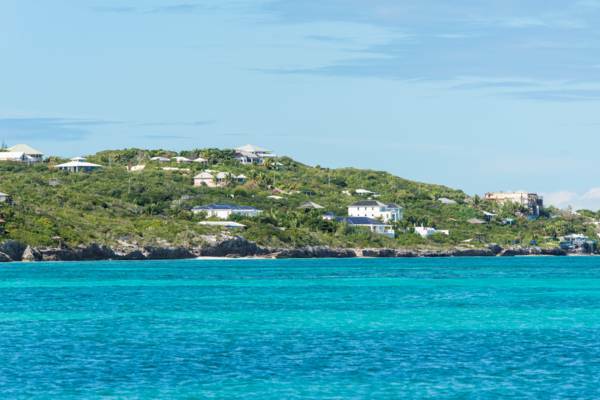 Blue Mountain is located on the central north coast of Providenciales. The area is mainly residential, with a mix of private homes and luxury rental villas. A coastline of interspersed limestone cliffs and isolated beaches edges this region. Although typically sheltered, many of these beaches lack the expanses of white sand found at many other beaches on Providenciales, and the ocean floor tends to support lush seagrass, which isn’t optimal for general swimming. Snorkelling however can be excellent at many spots. There are no public accesses to this beach from the interior Blue Mountain area, but it’s possible to walk up from Babalua Beach. To ensure that there will be beach between the cliffs and ocean, it’s best to explore this area at low tide. 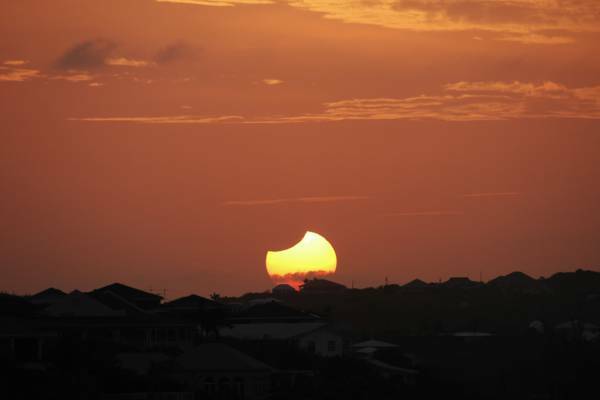 Solar eclipse over Blue Mountain. The peak of Blue Mountain is the highest point on Providenciales, with a height of 156 feet (48 meters). This hill shares the title of highest point in the country with Flamingo Hill on East Caicos. Beautiful views can be had over Blue Hills, Thompson Cove, Turtle Cove, Downtown, and the north coast barrier reef. Both Blue Mountain and the nearby settlement of Blue Hills share name origins. Due to the scattering of visible blue light caused by atmospheric moisture (an effect seen throughout the world), the island typically has a blue hue when seen from a distance, especially at midday. The permanent settlement of Providenciales occurred a bit later than what Grand Turk, Salt Cay and South Caicos experienced, so many early Turks and Caicos travellers and residents mainly saw Providenciales from outside the barrier reef or from far out in the Caicos Banks. Only the hills and high ground were apparent and they appeared blue, which resulted in the names we know today. Blue Mountain never saw any major structures previous to the modern era, but the site was used as a lookout point by early planters (both Cheshire Hall Plantation and Brough Hill Plantation are found not far away) and wreck salvagers. Last reviewed by an editor on 4 October 2018.